a better informed world public about Africa and its wildlife. 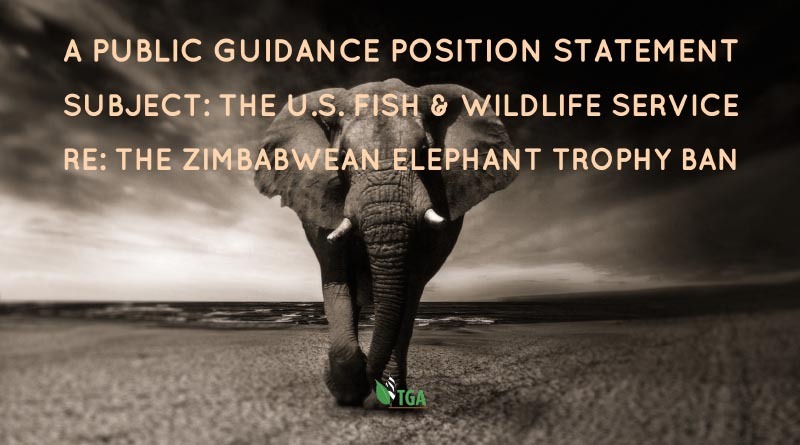 On April 4th, 2014, the US Fish and Wildlife Service (FWS) issued a press release stating that the agency lacked sufficient information to support a positive enhancement determination with respect to elephant trophies hunted in Zimbabwe during the 2014 hunting season. The finding, which was subsequently published in the Federal Register, banned the importation of such trophies going forward from the date of the findings. The Service also made negative enhancement findings in July 2014 and March 2015, each time concluding that information concerning the size of the Zimbabwean elephant population and the status of conservation efforts in Zimbabwe, did not support a conclusion that killing the animals “will enhance the survival of the species”. In southern Africa this was interpreted to mean that Zimbabwe was being punished because it (allegedly) could not guarantee the sustainability of its annual elephant hunting quotas. But there is more to this than meets the eye. In my considered opinion the real reason is far more sinister. This FWS action was challenged in court by Safari Club International (SCI) and the National Rifle Association of America (NRA) in 2017, but it came to nought. Federal Court of Appeals order invalidates decision to allow Zimbabwe and Zambia elephant and lion trophy imports. She went on to say: “The Court also held that the agency must take public comment on any blanket decisions to allow or prohibit imports based on individual countries’ management plans.” I take this to mean that the court has made it obligatory for the FWS to take cognizance of any public statements that involve the granting or the disapproval of permits for the importation of African trophies to America! I waded through the court papers but soon realised that I was fighting a losing battle. The rhetoric just made no sense to me. This does not mean that I believe the battle for sanity is lost, far from it, but rather that the Americans have a very different understanding than I do with regard to all that constitutes the principles and practices of science-based wildlife management. In a nutshell, therefore, the Americans speak a very different language to my language, and to my understandings of these matters. And I have to note that their decisions appear to be based more on uninformed and emotional animal rights opinion, than on scientific fact. All such FWS decisions are based upon the provisions of the U.S. Endangered Species Act (ESA); the composition of which is not supported by common sense, logic or science. The Endangered Species concept is a fallacy; largely because wild animals do not arrange themselves at the species level. They arrange themselves at the population level; and they can only be ‘managed’ at the population level, one by one. That makes the ESA a very dicey foundation for any kind of honest wildlife management discussion, deliberation or action; and it renders any management application ‘to a species as a whole’, fundamentally wrong. To make my interpretations totally clear, I must now, perforce, first define the terms species and population. Species: A species is a group of animals that share the same physical and behavioural characteristics (they look and act alike) and which, when they breed, produce fertile off-spring with the same physical and behavioural characteristics. Population: A population is a group of animals of the same species, the individuals of which interact with each other, in continuum, on a daily basis and which breed only with other animals in the same group. Now let us use the circumstances of the African elephant, Loxodonta africanus, to illustrate how and why it is necessary to manage wild animals at the population level; and to expose just how far off-base is the ESA and the FWS in this regard. The elephant lives in 37 countries in Africa. These countries are known as elephant range states. And within these states there are 150 different elephant populations. Some of these populations occur in evergreen montane forests; others in deciduous woodlands; others in savannahs (treed grasslands); others in heavy grasslands and reedbeds; others in dense deciduous thickets; others in swamps; and yet others in deserts. The elephant populations that live in these different habitat-types use them in different ways; and they impact on them differently, too. Some elephant populations are negatively affected by man the poacher; others benefit for interactions with man; and yet others are not affected by man at all. All these variously different environmental ‘pressures’ determine how each individual population should and must be managed. The manner that elephants impact on their habitats is determined by, among other things, how many elephants comprise each population; and how those numbers relate to the elephant carrying capacities of their habitat. NB: Elephant Carrying Capacity: is the maximum number of elephants a habitat can carry without causing permanent and progressive damage to the vegetation in their habitat. SAFE Populations: These occur in healthy numbers that are breeding well. They are constantly expanding but have not yet exceeded the carrying capacity of their habitat. They do not, therefore, cause permanent damage to their habitats; so they do not adversely affect the biological diversity of their local ecosystem. UNSAFE Populations: These are low in number, declining, and the reasons for the decline cannot be reversed. Such populations face probable local extinction. EXCESSIVE Populations: These are populations whose numbers exceed the carrying capacities of their habitats. They, therefore, continually cause irreparable and progressive damage to the vegetation in their habitats, on which they rely for survival; that, in turn, causes massive biological diversity losses; and it results, too, in the ultimate desertification of their ecosystem. NB: Given the fact that the principal purpose of a national park is to maintain its species diversity, over-and-above-all-other-considerations, the maintenance of excessive elephant populations in a national park is absolutely wrong. It is the most inexcusable example of MIS-management. To understand this complex conundrum there are number of other basic wildlife management principles we need to comprehend. Ecosystem: This is a community of living organisms (plants and animals) in conjunction with the non-living components of their environment, interacting as a single functioning system. The biotic and abiotic components are linked through nutrient cycles and energy flows. The abiotic components encompass the entire physical environment including all aspects of the weather (sun, shade, wind and rain); temperature (heat, cold, snow, ice and fire); the soil; rocks; mountains, rivers and lakes; the combined physical aspects of the different seasons; the condition of the atmosphere; and all other non-living components of the environment. Biological Diversity: This term covers the variability of living organisms (plants and animals) in an ecosystem, and the ecological complexities of which they are all an integral part. These organisms vary from buffaloes to butterflies, and from worms and bugs to bacteria. Many animal species are especially adapted to particular habitat types, so when excessive elephant populations over-utilise their habitats, the more sensitive vegetation components are quickly eradicated; and the animal species that are especially adapted to them become locally extinct. It is for this reason that our national parks management priority is, and must remain the maintenance of biological diversity; and the state and vigour of its biological diversity is a measure of the quality of a national park’s management. Keeping the ecosystem in a healthy state is closely linked with preserving biological diversity. Why is man the principle beneficiary? Because it is man’s desired objective that is attained (even when that objective is to maintain the ecosystem in a healthy state; or to maintain a national park’s biological diversity). There are two functions of wildlife management: Preservation and conservation. Conservation management is applied to SAFE animal populations. Its purpose is, inter alia, to make sure that SAFE populations do not become UNSAFE; or that they do not increase in number to the point that they become EXCESSIVE. SAFE elephant populations MUST be culled and/or hunted every year to stabilise the population at a number that remains, consistently, below the habitat’s elephant carrying capacity. SAFE animal populations can and should be used in a wise and sustainable manner for the benefit of mankind. The word conservation, therefore, is concerned with sustainable use/sustainable management. SAFE populations can be sustainably hunted; harvested for their intrinsic products (meat; horns; tusks; oils; fur; skins and bones); and some animals can be captured for live sale. Preservation management is applied to UNSAFE animal populations. It effectively protects the population from all harm and its ultimate objective is to make UNSAFE populations SAFE. EXCESSIVE animal populations are off the regular wildlife management chart. There is only one way to treat excessive wild animal (e.g. elephant) populations and that is to reduce their numbers as quickly as possible. The requirement to reduce their numbers ‘as quickly as possible, is imperative because it is necessary to eliminate ‘as quickly as possible’ their progressive and continuous damage to habitats, to ecosystem health and stability, and to biological diversity. To what extent should excessive populations be reduced? They should be reduced to numerical levels that are commensurate with the sustainable carrying capacities of their habitats! The purpose of population reduction management is to restore EXCESSIVE (elephant) populations to a state where they are, once again, SAFE. And that means to a state where they are no longer destroying their habitats, the ecosystem in which they live, or biological diversity. It must be stated that those who believe that the application of eco-tourism to an elephant sanctuary replaces the need to cull SAFE elephant populations (or to ‘reduce’ the numbers of EXCESSIVE elephant populations), are mistaken! Non-consumptive eco-tourism is NOT a substitute for wildlife management. For tourism itself to be sustainable, it has to be constructed on the foundation of a healthy and stable ecosystem (which means a properly managed ecosystem). If tourism infrastructure is constructed on an unstable ecosystem it will collapse when the ecosystem collapses, as it surely will. It is foolhardy, therefore, to heed the uninformed and unqualified wildlife management advice of tourism operators whose livelihoods depend (so they believe) upon them displaying to their nature-loving clientele, massive wild animal spectacles (EXCESSIVE populations). One of their claims is that non-consumptive eco-tourism is the best, most lucrative, most sustainable and most humane way, to ‘use’ wildlife; and that, that being the case (in their opinion), culling can and should be abandoned. THAT is nonsense; and an unacceptable animal rightist’s platitude. (3). To ‘use’ ANIMALS wisely, sustainably and humanely. Animals come last on our hierarchical list of management priorities not because they are UN-important but because they are LESS-important than the soil and plants. People in the business of wildlife tourism need to understand that the maintenance of stable and healthy ecosystems, and of complex biological diversities, is necessary for BOTH the consumptive and the non-consumptive ‘use’ our wild natural resources. The one is not better than the other. They are merely different dimensions of the same thing; the ‘use’ to which man puts his wildlife resources. Tourism operators are not wildlife management experts. Most of them have no idea about the importance of ecosystem stabilities; maintaining biological diversities; and maintaining habitats and the wildlife populations that depend upon them, in a healthy and balanced state. Seemingly, most tourism operators are ONLY interested in being able to continually increase their clients’ excitement by exposing them to more and more excessive wild animal populations; the more excessive the better! Responsible, intelligent and consumptive wildlife management, however, goes hand in glove with responsible and intelligent non-consumptive ecotourism. And both should be sustainable. The general public does not have to ‘like’ sustainable-use wildlife management practices. But everybody DOES have to understand and accept that the proper management of our wildlife resource is essential for the well-being of our soils, our wild plants and our wild animals upon which mankind depends for his survival; and upon which our civilization is dependent, too. Man is a dominant component of the animal kingdom and he is subject to the natural laws of nature. He is a vital and integral part of the earth’s food chains and food webs; and attempts by urban man to exclude humanity from this reality are ridiculous. Man requires the same things to survive, that wild animals need to survive. He, therefore, competes with wild animals in the global survival stakes; and if he does not write this reality into his wildlife management equations, whatever he does in his attempts to stop wild species extinctions today, will come to naught tomorrow. And because of Africa’s massive human population explosion, this fact is of particular importance to Africa in this day and age. NB: United Nations figures indicate that in the year 1900, there were 95.9 million people living in Africa south of the Sahara Desert. By the year 2000, this number had grown to 622 million – a 6.5x rate of increase in 100 years. If this is repeated during the current century, there will be over 4 billion people living in this same region of Africa by the year 2100. And Africa’s wildlife managers are very cognizant of this likely outcome. The only plant and animal species that are assured of survival in Africa in the long term are maize, spinach, cabbages, bananas; and cattle, sheep and goats. Why? Because these cultivated plants and domesticated animals are the only species that provide mankind in Africa with his survival needs. He cannot do without them! When survival stakes are all that a man in Africa has to think about, he will not grow beautiful flowers in his garden. He will grow maize, spinach, cabbages and bananas; and he will not want to protect elephants, buffaloes, lions and leopards. Not only are such wild animals of no value to him, because he can’t use them or sell them, they are actually a liability because they eat his crops and kill his domestic animals. And the wild herbivores eat the wild grass and the wild shrubs that his domestic stock need to exist. Unmanaged wild animals also sometimes transmit disease to his domestic stock. For all these reasons, at this moment in time, most rural black people in Africa would rather see all wild animals killed. They have a hard enough time surviving themselves as it is, without having to compete with wild animals for a place in the sun. Africa’s progressive wildlife managers are conscious of all these facts and they want to add wild animals to the list of species that can help Africa’s people to survive. They want to make it possible for wild animals to contribute to the survival prospects of Africa’s rural people in a similar manner to the way that their cattle, sheep and goats do. There is, however, a significant and important difference between wild and domestic animals. Wild animals are infinitely more valuable than are the people’s cattle, sheep and goats. This is a good factor because it opens the door for the creation of a completely new wildlife management paradigm that could greatly benefit the people of Africa for ever. It is possible; and it is desirable. Africa’s wildlife managers believe that if they can integrate the needs of the people with the needs of the wildlife, in a state of symbiotic harmony, the survival of Africa’s wildlife will be assured forever. This ideal truly represents “best practice” wildlife management in Africa. The institution of this conservation model will stop poaching. Why, because the people will own the wildlife (even if it is only an emotional ownership) and they will derive huge survival benefits from its legitimate and sustainable harvest. Indeed, it is certain that they will obtain far greater benefits from their wildlife than they could possible earn from their cattle, sheep and goats. It is not in anybody’s interest to steal from themselves, which is why so they will stop poaching! NB: The people of New York City do not ‘own’ Central Park. God help the mayor, however, if he tries to replace the park with high rise buildings. Even if he has the political power to do that, the people of New York City would lynch him if he tried. The citizens of New York, therefore, may not legally ‘own’ Central Park, but they have an immense ‘emotional ownership’ over it; and they will defend its continued existence and proper management, with their lives. THIS is the kind of emotional ownership, over their wildlife, that Africa’s wildlife managers want to instill in the hearts and souls of Africa’s rural people. Indeed, in the face of Africa’s hugely expanding human population, the managers recognise that this ideal is the ONLY way that Africa’s wildlife can possibly survive into posterity. The TGA is urging the whole world to understand the simple truth of this desideratum; and it is encouraging people everywhere to help us make it happen, which they can do simply by taking the trouble to understand, support and not oppose the wisdom of this philosophy. These three entities are proven enemies of Africa because they are the biggest impediments to Africa creating what Africa itself wants to achieve for itself. They believe that: (1) they know better than Africans do, with regard to what is best for Africa; (2) they have the right to dictate to Africa and will brook no objections; and (3) their own arrogant requirements supersede in importance all that Africa wants to achieve for itself. Many progressive African states want to sustainably utilise their wildlife to benefit their rural people and to boost their economies. From SAFE and EXCESSIVE wild animal populations, they want to hunt what is huntable, and to harvest surplus wildlife stocks and market their wildlife products on open, honest, and transparent international markets. This includes markets for ivory and rhino horn. And what they don’t need is for First World governments and international animal rights NGOs to stand in their way. Africa’s wild animals are African assets. They are very valuable African commodities that are not owned by non-African governments, by CITES, by the animal rights NGOs in the First World; or by the FWS. And Africa resents the interference in Africa’s wildlife management affairs by all these people. AFRICA’S GREAT ELEPHANT CENSUS (GEC). Africa’s much vaunted continent-wide elephant count was concluded in 2016, at great expense and with great effort by many, many people. I do not denigrate the expended effort involved. BUT, the count covered only 18 of Africa’s 37 elephant range states. Nineteen range states were not included. Nevertheless, I understand the explanations given; and, with reservations, I reluctantly accept the long list of elephant numbers counted, sanctuary by sanctuary. All the world really got out of the GEC was a long list of numbers. Numbers of different elephant populations. Not one of those numbers was accompanied by even the inkling of an indication as what might be the elephant carrying capacities of their individual sanctuary habitats. Hence, we have no idea whether the elephant populations counted were/are SAFE, UNSAFE or EXCESSIVE. This negates one of the stated purposes of the GEC: To help the world and our wildlife managers to better understand and to better manage Africa’s elephants. I know, for example, that every elephant population in southern Africa is EXCESSIVE. Indeed, they are all GROSSLY excessive. That means, if the ecosystems and biological diversities of the national parks that support these populations are to be preserved; and if we are to avoid having the game reserves become deserts; massive elephant population reduction is necessary. In round figures, the elephant numbers in Botswana’s north-western wildlife sanctuaries (Ngamiland) stand at c.200 000; in Zimbabwe’s Hwange National Park, 50 000; In Zimbabwe’s Gonarezhou National Park, 12 000; and in South Africa’s Kruger National Park, 20 000. Contesting and tweaking these numbers will not change the reality of their management requirements. Because I have a very good idea of the carrying capacities of all these wildlife sanctuaries, I can state without fear of intelligent contradiction, that all these population numbers are grossly excessive. And THAT means they will have to each be reduced in number, for good and sound management reasons, by at least 50 percent (in a first management action). This provides one example illustrating how the perceptions thrown out by these GEC numbers, are misleading. Even if ALL the numbers are 100 percent correct, therefore, nobody can tell you whether or not those elephant populations are sustainable. In southern Africa they are not! The GEC states that, compared to previous counts, elephant numbers in Africa have declined by 30 percent; and, they say, without any kind of proof, that the declines were caused by “poaching”. That statement, of course, rang alarm bells right through the First World; and a witch hunt ensued to “stop the poaching” and to destroy all Far Eastern markets in ivory and rhino horn (because everybody believes in the animal rightists’ promoted myth of a Chinese mafia – see below). The number of elephants, purported to have been killed by poachers (since 2007), was 144 000. During the period 2008 to 2012, 44 000 elephants were ‘poached’ in Tanzania’s Selous Game Reserve, the blame for which Tanzanian citizens point a straight finger directly at their own country’s president of that era. ‘Tens of thousands of elephants’ were reportedly poached in the northern parts of Mozambique (2008 – 2014) where again surreptitious fingers are pointed at elements of that country’s political elite. And it has been said that many tens of thousands of elephant were not counted in the 19 range states that were left out of the census. Altogether these figures account for at least half the 144 000 reported to have been “killed by poachers”; but WHO, exactly, were these ‘poachers’? There are certainly Chinese and Vietnamese buyers of illegal elephant ivory and rhino horn all over Africa; as there are black and white people doing the same thing. We cannot and we must not, therefore, blame the Chinese for everything; especially when there is so much evidence to indicate that what the local people say is true – that the MAIN elephant poaching events have all been orchestrated by Africa’s political elite. The figures suggest that over half a million elephants were killed by the political elites of Kenya and Tanzania (alone) between 1970 and 1993; and yet another (aforementioned) 44 000 were killed in Tanzania’s Selous Game Reserve between 2008 and 2014. Plus, we can add the north-Mozambican kills during the last ten years. Other figures suggest that 10 000 black rhinos, 5 000 zebras; and 22 000 Colobus monkeys, were killed by these same ‘poachers’ (the political elite) in Kenya, during the 1970s. Who did the killing? Village hunters were key players but they were employed by, and given immunity from arrest by, their senior political masters. Others included game rangers, the military, the police, politicians, the civil service, and some professional hunters who climbed on the bandwagon, too. But it was all done with the knowledge and approval of the presidents of these countries; and the contraband was all exported from East Africa’s Indian Ocean seaports without CITES papers but with presidential approval. If we continue to chase illusionary moonbeams, thinking and telling everybody that the Chinese and the Vietnamese have been and still are behind the big poaching events in Africa, we will never get to the bottom of Africa’s poaching scandal. We must get the whole world to know who the real culprits are! 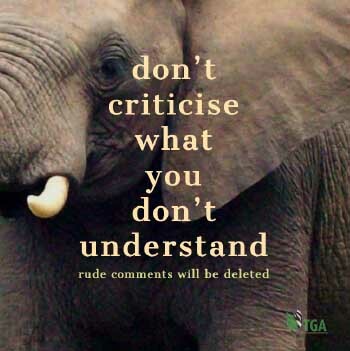 CITES, the FWS and every government in the West, need to understand that if they (deliberately or unconsciously and without concern for the truth) continue to disseminate animal rights propaganda into the public domain; if they insist on closing down ivory and rhino horn markets in the Far East; and if they continue to deny legitimate African ivory and rhino horn producers access to legal markets, they are actually hammering the final nails into the lid of Africa’s wildlife coffin. The unfortunate fallout from this whole debacle is that IF the markets for ivory and rhino horn are closed down in the Far East, it will not be to the advantage of those African countries that can still produce legal ivory and legal rhino horn. So we need some enterprising journalist to investigate this state of affairs, with the object of getting the truth out into the big wide world. In the meantime, the TGA is telling the Far East – China; Vietnam; Laos; Cambodia, Hong Kong, Taiwan and Japan – NOT to close down their ivory and rhino horn markets; but to enter into negotiations with the SADC countries of southern Africa with the idea that a new and legal wildlife products market can be set up to absorb Africa’s legally produced ivory and rhino horn. My deep-seated concerns, however, have nothing to do with the well-being and continued existence of CITES or the FWS. For all I care about them, they can rot in hell if that could be arranged. My concerns are about Africa, its people and its wildlife. It doesn’t help Africa if CITES and the FWS continue to perpetuate the myth of the so-called “Chinese Mafia”; and if they turn a blind-eye to the involvement of Africa’s political elites in the continent’s massive commercial poaching scandal. NOTHING can or will be resolved until the truth comes out! And it is going to come out! Zimbabwe has a history (dating back to 1975) for promoting and implementing wildlife management programmes for the benefit the country’s rural people. CAMPFIRE (an acronym for ‘Communal Areas Management Programme for Indigenous Resources’) is the first of its kind in the world to consider wildlife as a renewable natural resource, and advocating the allocation of its ownership to indigenous people. CAMPFIRE was initially supported and funded by the United States! Elephants were often killed by Zimbabweans because they were crop-raiders; and because people were killed by rogue animals. CAMPFIRE began its programme by selling 100-150 elephant hunting licenses per year for between 12 000 and 15 000 US dollars each. All the hunting was conducted outside the Parks and Wildlife Estate; and the revenue earned was paid to the local rural councils and left with them to work out how it should be used. Ad hoc elephant killings were reduced as a consequence, and poaching stopped. The US Federal government initially invested in CAMPFIRE through USAID, but this created controversy in U.S. politics. CAMPFIRE leadership lobbied in favour of the legalization of the sustainable and consumptive-use of elephants (what, in the U.S was referred to as being an endangered species). The purpose of the Zimbabwean strategy was to increase the value of the elephant as a species; to get that value into the local people’s pockets; and to thus induce them to stop elephant (and other game) poaching. This policy, however, clashed with the majority preservationist (animal rightists & anti-hunting) public sentiment in the U.S. It was said the process was not in compliance with U.S. national law; and that it clashed with international law, too, (i.e. with the dictates of CITES). By 2014 the U.S. stopped the importation of legal elephant trophies into the USA from Zimbabwe, halting much of the hunting carried out in CAMPFIRE communities by high-fee-paying U.S. citizens. This put the programme at risk. Between 1989 and 2006, the revenue earned by CAMPFIRE exceeded US$ 30 million; and the income earned by those individual households who had participated in CAMPFIRE’s programmes since its inception, increased by 15-20 percent (ref WWF). During this same period, it was estimated that elephant numbers increased; buffalo numbers remained stable; and habitat degradation diminished/in some areas improved. Elephant hunting for cash continues but in a very small way; and since the ban there has been a significant decline in revenues. There has also been a concomitant increase in elephant poaching by local communities. It seems that if the local people cannot earn a legal income from the super abundance of elephants that surround them every day, they intend to get that same income by illegal means. One way or another they need the cash to survive! In all this there is a major clash of wildlife cultures. The American wildlife culture is anti-market hunting. You can buy a licence and shoot a white-tailed deer in the United States, but you cannot sell its meat. You can’t even order a white-tailed deer steak in an up-market restaurant in the middle of New York City because it is illegal to buy and sell indigenous game in America. These two examples of contradictory national wildlife cultures are, perhaps, as far apart as any two wildlife cultures can possibly get. They are the antithesis of each other. This is an issue that complicates wildlife relationships between the people of the USA and the sovereign states of southern Africa. And it is one of the reasons why many Americans blindly oppose wildlife being bought and sold in southern Africa. Note what I said a few paragraphs back: “This policy (concerning the American government’s one-time financial support for CAMPFIRE) clashed with the majority preservationist (animal rightists & anti-hunting) public sentiment in the U.S. It was said that it was not in compliance with U.S. national law; and that it clashed with international law, too” (i.e. with the dictates of CITES). In other words, Americans have no knowledge of southern African wildlife cultures or how they differ from the American model; or why! And they do not understand why they should support (or at least not oppose) the selling of wildlife products in southern Africa when they (the Americans) have been indelibly indoctrinated, since they were toddlers, into believing that making money out of wildlife is immoral. NB: It is necessary to make mention of the fact that national cultures are comprised of many sub-cultures, such as language; dress; politics; dance; song; sport; food; wildlife; architecture; religion; and many more; and that children start absorbing these sub-cultures at a very early age. They go to church with their families every Sunday morning, and they fish or hunt with their fathers every weekend. They learn their home language and they dress as all the people around them dress. And by the time they are adults all those cultural values are indelibly imprinted on their minds and in their psyches. By then their perceptions of what is right and what is wrong cannot be changed. And look at what has happened to Islam in recent years! When subcultures clash, wars can and have ensued. So don’t consider lightly, the power of culture to influence people’s beliefs and actions. At CITES this problem is greatly compounded by the fact that the convention comprises 183 sovereign states, all of which have their own wildlife cultural beliefs. This has not, however, yet been seriously manifest at the convention to my knowledge. It MUST, however, be GREATLY confusing to an anti-market hunting sovereign state delegate when he is confronted with having to vote on whether or not to allow a southern African state to sell its stock pile of legally procured ivory or rhino horn. The question is: Would he vote according to the facts of the matter; or would he vote in accordance with his doctrinaire upbringing? I can assure it will be the latter! Now we come to a major issue. Detached-from-nature urban societies in the First World look upon wildlife as something of a sacred cow. But NOT in southern Africa! The states of southern Africa consider wildlife as being a WILD ‘product of the land’; that cattle, sheep and goats are TAME (or domestic) ‘products on the land’; and nobody sees anything wrong with using both WILD and TAME ‘products of the land’ for the benefit of Africa’s people. This reality equates WILD and DOMESTIC ‘products of the land’ and that fact justifies southern African wildlife management programmes that integrate the needs of rural man with the needs of wildlife. The only difference between WILD and TAME ‘products of the land’ is the manner of their harvest. There are major differences between the principles used by the Americans in their wildlife management philosophy, and those used in Africa, especially when determining hunting quotas. They talk about the need for hunting to ‘enhance’ the status of the species concerned; and that it should not incur ‘detrimental’ consequences. This may be valid thinking when hunting completely free-range wild animals in a colonial-style Africa, or in the Rocky Mountains of America, but in the modern states of southern Africa it is an outdated management style because most hunting takes place – in South Africa anyway – on game ranches where the hunted animals occur inside adequately fenced enclosures. NB: All game ranches in South Africa, some of which are very, very large estates, are surrounded by high ‘adequately fenced enclosures’ because that is a legal imperative if the landowner wishes to claim ownership of the game animals on his property. When wild animals are considered to be a WILD ‘product of the land’ they become little different to TAME ‘products of the land’. And wildlife managers in southern Africa are most concerned about the fact that whatever harvesting or hunting takes place on a game ranch, it should be sustainable (repeatable). Indeed, any and all wildlife management practices are normally considered to be acceptable ONLY if they are sustainable. And because the privately owned wildlife in South Africa is contained inside game fences, the ‘enhancement’ value or ‘detriment’ issues of every hunt is under the full control of the game rancher on whose land the hunting takes place. Government agencies do not regulate such matters because the game belongs to its owner. Southern African states really don’t need, and they don’t want, the FWS to get involved in such details in Africa. In fact, although American wildlife management and hunting values might well be deemed necessary in America, they have no real application in southern Africa. Furthermore, the southern Africans believe that they have the sole right to determine what represents acceptable hunting conditions in their own countries; and they object to a foreign entity imposing its will and its own standards, on Africa, without African consent. THIS is where the clash of wildlife cultures is most greatly manifest. In Zimbabwe the government owns the elephants that are hunted in that country, so the government regulates and controls what it wants to see done. It doesn’t need a foreign state, that doesn’t bother to do its homework, that hasn’t as clue about elephant management, to tell it what it can and cannot do with its elephants! Southern Africans see nothing wrong and whole lot right, with the idea of man living in symbiotic harmony with nature. This is what the IUCN’s (International Union for the Conservation of Nature) World Conservation Strategy (WCS) recommended in 1980. That same year, the whole world proclaimed the WCS to be the BLUEPRINT that would take man and nature, in symbiotic harmony, into posterity! Furthermore, every single sovereign state member of the IUCN obligated itself to model its National Conservation Strategy (NCS) on the WCS template. All the states of southern Africa were amongst their number. So, the original South African National Conservation Strategy became an almost verbatim replica of the WCS; as was the case in Zimbabwe, too. (notably fish and other wildlife, forests and grazing lands) which support millions of rural communities as well as major industries. This principle is now enshrined the new South African constitution. It is also a cornerstone principle of all southern African wildlife legislation, including Zimbabwe. So, what has changed? The states of southern Africa have not changed. What appears to have changed is that the growth and power of the animal rights movement in the developed world has grown beyond recognition and is now out of control. First World governments are now cow-towing to the animal rightists’ demands; CITES has been taken over by its accredited animal rights NGOs; and organisations like the FWS are not prepared to rein them in. The same thing seems to apply to the courts in America. And the animal rightists still repudiate the objectives of the WCS! This is a problem that is adversely affecting wildlife all over the world. Everybody takes it for granted that paedophiles and rapists should not be allowed to participate in conferences that deal with abuse against women and children. So why does society insist that animal rightists should be allowed to participate in highly complex debates concerning the sustainable-use-management of wild animals, when it is a known fact that their purpose in life to abolish all animal ‘uses’ by man. The animal rightists’ purpose in wanting to participate in such a gathering is not to make the meeting successful and productive, therefore, but to sabotage its purpose! The animal rightists are the paedophiles and the rapists in the world of wildlife management! I have heard it said that the animal rightists have a democratic right to have their opinions heard, but that is nonsense. If that be true, why then do the paedophiles and rapists not have the same right to stand on their soapboxes in public, there to promote their pernicious activities? There is nothing more foul in social circles than paedophiles and rapists. There is nothing more obnoxious in wildlife management circles than animal rightists. There are double standards at work here, therefore, about which intelligent and responsible people are giving no thought. But in America it doesn’t seem to matter. All the animal rightists have to do to have their voices heard, is to look for support from their fellow travellers in USF&WS; and the America courts seem to prescribe it! To ensure the sustainable utilisation of species and ecosystems (notably fish and other wildlife, forests and grazing lands) which support millions of rural communities as well as major industries? Whether the anti-hunter animal rightists in America agree with this WCS objective or not, this was a desideratum that everybody once upon a time zealously supported. Therefore, Zimbabwe is right and the American animal rightists’ are wrong; and if the FWS is so deeply in bed with the animal rightists as I believe it is, the FWS is also wrong. And it is my very strong opinion that, to maintain its credibility in the eyes of responsible and honest wildlife managers everywhere, the FWS should be avid in its support for this WCS point of view.Furthermore, nobody has instructed Zimbabwe to deviate from this well worn and well established path. It is the FWS, therefore, that is out of step. When and why did they change their tune? Now let’s look at the facts of the matter relating to the banning of the importation to America of legally acquired elephant trophies from Zimbabwe. In the process, let’s not forget that the elephant cannot be managed as a species; and that the endangered species concept is a farce. Remember, too: every single one of Africa’s 150 elephant populations has a very specific management need that is unique to itself; they are all different; and they need to be managed population by population. And, last but not least, don’t forget the very different and very important elephant population statuses: SAFE; UNSAFE; and EXCESSIVE. There is absolutely no question about the fact that there is NO one-size-fits-all elephant management strategy for Africa. If there was, the endangered species concept would be valid; and we now know that that is not the case. NB: I happen to know, very well, the earlier facts of elephant management in both Zimbabwe’s Hwange and Gonarezhou National Parks because I worked in both those sanctuaries when the very first national park elephant management programmes were applied. And it was me who applied them! A colleague and I spent three years (1961-63) attempting to reduce Hwange’s excessive elephant population from 3 500 to 2 500. We failed, because multiple new game water supplies in the park enticed very large numbers of elephants from Botswana into the park. This increased the Hwange elephant population (between 1960 and 1965) from 3 500 to 6 500. Thereafter formal elephant culling operations were instituted inside the park with which I was not involved. In the 1960s I routinely patrolled the whole of Hwange on horseback for weeks on end, accompanied by Bushman trackers and pack mules. I was later (1981) appointed to the post of Provincial Game Warden-in-charge of Hwange. So I got to know Hwange’s 5 000 square miles (13 000 sq. kms) very well. In 1971/72 I lead the population management team that reduced Zimbabwe’s Gonarezhou elephant population from 5 000 to 2 500. I was also the Game Warden-in- charge of the Gonarezhou for nearly 6 years (1968 to 1974). So I also know Zimbabwe’s 2 000 square mile (5 000 square kilometre) Gonarezhou National Park well. Hwange’s elephant population now numbers some 50 000. It is said to vary in size (depending on emigration/immigration between Hwange and Botswana) from 35 500 to 80 000. It matters not at all which is these figures are right because, compared to the elephant carrying capacity figures, it doesn’t matter. Hwange’s elephants are not a separate population. They are part of Botswana’s Ngamiland mega-population which includes elephants that move between Ngamiland, North-eastern Namibia, South-eastern Angola, South-Western Zambia and Western Matabeleland (Hwange) in Zimbabwe. This mega-population probably numbers in excess of 300 000. In 1960, I was a part of a National Parks Board meeting, held at Hwange’s Main Camp, when the park’s elephant carrying capacity was very seriously debated. The elephant count that year was 3 500; and because those elephants were eliminating several dominant tree species in the park, 3 500 was deemed to be too many. It was decided, at that meeting, to reduce the population to 2 500, to see if that would stop the habitat damage. We never achieved that goal! 2 500 elephants in a 5 000 square mile national park equates, on average, to one elephant per two square miles. During my period of service as the Game Warden-in-charge of the Gonarezhou (1968 – 1974), major research was carried out to determine the extent of the damage to the park’s habitats caused by its excessive population of 5000 elephants. Entire riverine forests along the lower Lundi River, and along the Nuanetsi River to the south, were being wiped out. Huge areas of mature deciduous mopani woodland were being reduced to scrub. Healthy sandveld woodland was being demolished. And the national park’s iconic baobab trees were being decimated. The elephant attack on the park’s baobabs was precipitate. Over a period of two years (1969 & 1970), 23 percent of the baobab trees in the park were killed by too many elephants. Ninety-four percent were either killed or damaged during that period. The remaining 6 percent were undamaged solely because they grew in very remote broken hill country where the elephant herds rarely ventured. The biggest of our baobabs were said to be 5 000 years old. This meant they were already 1 700 years old when Tutankhamun was Pharaoh of ancient Egypt. Those massive baobabs were, in fact, therefore, infinitely more important than the elephants that were killing them! I don’t have the same confidence determining the carrying capacity of the Gonarezhou that I have when doing the same thing for both Hwange and the Kruger National Park in South Africa. Hwange and Kruger (8 000 sq mls; 20 000 sq kms) have a very similar sustainable carrying capacity; roughly one elephant per two square miles. And those figures I am prepared to argue about with anyone, anywhere and at any time. The Gonarezhou is different because I have no measurable yardsticks against which I can gauge my conclusions. Suffice it to say, however, that the Gonarezhou is only 50 miles north of Kruger National Park and their habitats are very similar. It is also a much drier park than either Kruger or Hwange, so I presume its elephant carrying capacity must be, pro rata, smaller. I guess, however, that it cannot be very much different to that pertaining in Hwange or Kruger (one elephant per two square miles). What is pertinent about the Gonarezhou is the fact that habitat devastation between 1968 and 1970 was horrific with additional damage visibly noticeable almost daily. And in those days, before the population reduction exercise took place, the elephants numbered 5 000. And because of the damage being done in 1968-1970, that number must be understood to have been GROSSLY EXCESSIVE. Even after we had reduced this population to 2500, the rate of habitat damage continued seemingly unabated. So, 2 500 was clearly also excessive. If there were too many elephants in the Gonarezhou when they numbered 2 500, therefore, how much more overpopulated is it today when the number is in excess of 12 000? This information and explanation, however, is enough to make my next point, which is about Zimbabwe’s elephants. Hwange National Park is carrying 20 times as many elephants as it should, and the Gonarezhou is carrying, arguably, 12 times the number that it should. Now let’s get back to the hunting quota issue. The incremental (reproductive) rate of both populations (Hwange and the Gonarezhou), taken together (at an arbitrary and nominal 5 percent per annum), comes to 3 100 a year. So, sustainable hunting quotas could/should have been calculated as a percentage (acceptable up to 100 percent) of this number (for these two populations ONLY). And there is no-way that Zimbabwe has ever sport-hunted anywhere near that number of elephants in any one year. Add to that reality, the fact that both these populations, because they are grossly excessive in number, each need to have their numbers reduced (in a first management action) by at least 50 percent. That will provide an additional 25 000 elephants from Hwange; and another 6 000 from the Gonarezhou. So, the short term (non-detrimental) elephant (management) hunting potentials from these two Zimbabwean national parks ALONE, is huge. And the fact that both populations URGENTLY need reduction, I guess means that such hunting can be truly classified as ‘enhancing’ the survival of the species. I hope these legitimate facts and management observations are enough to convince the FWS that its doubts about Zimbabwe being able to maintain its hunting quota in 2014 were totally without foundation. But I reiterate: I don’t think that was a real, truthful, reason why that elephant trophy import ban was enforced. The stated reason why FWS banned the importation to America of elephant hunting trophies from Zimbabwe in 2014 was, ostensibly, because Zimbabwe could not guarantee its annual hunting quotas. If that was really the excuse for the ban, then the banning application was and remains just too absurd for words. There is no scientific, justifiable wildlife management reason, or commonsense support, for the Service to have made that decision on those grounds. So why did it do so? NB: This indicates that the FWS used the animal rightists’ opposition to CAMPFIRE (a sustainable-use project) to support the trophy ban. That is unconscionable. It is also NOT the way that a leading world wildlife organisation, that purports to be ‘scientific’, should operate. No greater indictment is necessary to condemn the integrity of the FWS. Coupled with all the foregoing, I found these comments very illuminating, because over the last 35 years, I have watched CITES and the WWF going off the rails all along this same path; and now the IUCN is joining the throng. It, too, is inviting died-in-the-wool animal rightists to join their union. Today, the FWS bases its decisions, not on science or wildlife management principles, but on popular animal rightist opinion. They have said as much in the two paragraphs above. The decision to ban the importation, to America, of legally procured elephant hunting trophies from Zimbabwe in 2014, is in line with many other similar American animal rights objectives. In this case, therefore, I sincerely believe that the FWS fulfilled the desideratum of one of its animal rightist friends; and brought it into law. The FWS, in my opinion, therefore, is now merely a mouthpiece for the American animal rights movement. It can no longer be considered a reliable, responsible, honest, intelligent and scientific wildlife management agency. I first reported on the possibility of this happening in the early 1990s, when Sue Lieberman, recently a senior executive of the Humane Society of the United States (HSUS), was employed by the FWS as its ‘Expert Advisor on CITES’; and she remained in that position for 10 years. Is it any wonder, therefore, that the FWS is the way it is today? So, I have watched the FWS regress from being an honest scientific wildlife force in the early 1980s to the mere lackey of the animal rights brigade that it is today. This whole fiasco has had a number of good outcomes. It has shown the world that the FWS has absolutely no idea about the realities of elephant management in Africa; that the FWS is not at all qualified to advise Africa on elephant management issues; that the FWS has exhibited no understanding of the fact that when local rural communities in Africa get to enjoy the considerable benefits that can accrue to them from the limited and sustainable harvest of readily available elephants, it will induce them to stop poaching (nor does it seem that that desirable outcome is of any concern to the FWS); that the FWS has no idea about the facts surrounding Africa’s poaching pandemics over the last 50 years; that the elephant trophy ban has nothing to do with any FWS concerns about the proper management of Zimbabwe’s elephants; that the trophy ban had everything to do with the FWS wanting to satisfy the objections (to ‘the sustainable harvest of elephants’) raised by America’s animal rightist NGOs; and that the well-being and best interests of Africa’s wildlife and its rural people, is of no concern to the FWS. So African states should think very seriously about allowing the FWS (and CITES) to meddle in their wildlife management affairs. Only bad outcomes can result from Africa meekly complying with the demands of the FWS and CITES. Neither CITES nor the FWS, are ‘with’ Africa in its desire to manage and to harvest its wildlife for the benefit of the continent’s people. And both FWS and CITES are now so deeply committed to their involvement in their animal rightists’ propaganda programmes (which are specifically designed and geared to oppose the African wildlife management desiderata), they are now never going to change. The FWS has been under some considerable pressure from the protectionist and anti-hunting lobby in America for a very long time to stop, inter alia, elephant hunting (and trophy hunting generally), in Africa. Now it has capitulated to the enemy. Indeed, it is now joined-at-the-hip with our fiercest foes. FWS, therefore, has now abdicated from its self-imposed responsibilities as the self-appointed leader of the world’s wildlife management affairs. Science is no longer the FWS’s guideline. Animal rights opinion is the fact that now determines FWS policy. African states are concerned about the economic sanctions that could be applied by way of the Pelly Amendment should they ever disagree with the dictates of CITES or the FWS. NB: The Pelly Amendment is a piece of domestic legislation that enables America to apply economic sanctions on any country the does or says anything that ‘displeases’ America. The professional hunters will tell you that they don’t want to rock-the-boat because most of their hunting clients come from America; and they don’t want to lose them. Many African politicians will tell you that if America retaliates, by applying the Pelly Amendment to anything that America ‘does not like’, it will devastate their country’s economies. So, they say, it is simply not worth rebelling against American dictates on wildlife issues no matter how distasteful that might be to some. And to avoid such a short term catastrophe, the politicians are prepared to pull the plug on Africa’s wildlife heritage and let it run down the drain. So, reason has flown out the window. As I said before, anarchy looms; or is it that anarchy already reigns…? What has happened to Africa’s pride? Have the sovereign states of Africa lost so much self-respect they are prepared succumb meekly to such unconscionable tyranny? What is going to happen to Africa if its leaders are so submissive to foreign powers and to the demands of the international animal rights brigade – which is part of an international racketeering and organised crime cartel? What is going to happen to Africa’s people and to its wildlife? The only people who really care are us Africans. Foreign states are not really interested (they have their own political problems to keep them busy); and the animal rightists are only interested in those wildlife controversies, like ‘Cecil the Lion’, to which they can embroider and add their own emotion-charged fabrications, for the sole purpose of making a great deal of money out of the gullible public, to swell their own bank accounts. Come on Africa, let’s do something about this! We cannot just lie down and roll over! As our good American friend, Godfrey Harris, the Managing Director of the Ivory Education Institute in Los Angeles points out, the people who are singing Africa’s wildlife management tune today are (1) all-white, (2) racist, (3) neo-colonialist and (4) animal rightist NGOs in the First World. These NGOs are of the opinion that the people of Africa are not capable of making their own decisions ‘about anything’; and who, for their own good, have to be told what to do and how to do it. How ignominious it is to be thought of, and treated, in such a manner? And this is all happening through the very good offices of the FWS and CITES! We, the people of Africa, cannot allow these foreign eco-racketeering fraudsters to win the day. Africa does not have to be told how to conduct its own wildlife conservation and wildlife preservation affairs; and we have the sovereign right to make our continent function the way we want it to function. We don’t have to succumb to political pressures from the West; to comply meekly to foreign demands from Europe and America that are not in the best interests of Africa, of Africa’s people, and/or of Africa’s wildlife. Indeed, Africa is more culturally aligned with China and the Far East than it is to Europe and America. Maybe it is in that direction, to the East, where we should start turning our faces? If just the SADC countries of Africa stick together we can fight this war and win. It is doubtful that the American administration will want to fight the whole of SADC! And if the 16 countries of SADC rebelled, the whole world would sit up and take notice! If we are going to remedy this unacceptable situation we are going to have to manufacture an act of defiance that will shock the whole world into the realization that ‘something’ is seriously wrong with today’s world-order. We have too much to lose if we don’t; and a great deal to gain when we do! The SADC countries should start to paddle their own wildlife management canoes once again. And the First World, especially America, should stop meddling in the wildlife management affairs of Africa. And, one way or another, we are going to have to excommunicate the animal rights brigade. The TGA is working on it! America’s FWS should be condemned by the whole world for allowing the animal rightists’ fabricated propaganda to dominate their unscientific assessment of Zimbabwe’s elephant hunting quotas (and much more). They should be seriously reprimanded for not doing their research and home-work on the real elephant situation in Zimbabwe (and elsewhere in southern Africa) before issuing elephant (and lion) trophy import banning orders that adversely affect hundreds of thousands of rural people in Zimbabwe. The FWS ascertainment that the African elephant is “an imperiled species” is very far from the truth (that idea was submitted by HSUS; and then endorsed by FWS). Furthermore, the elephant is not “a species that is threatened with extinction”. So, because these are the two legal determinations that the FWS used to support its trophy banning order, and because they are both completely untrue, their banning action was not authorised by the criteria outlined in the ESA (even though that Act is fallacious). It is very clear, therefore, that the FWS’s decision to ban these trophy imports was motivated, supported and carried through, by reason of purposefully constructed animal rightist propaganda lies. In southern Africa all elephant populations are EXCESSIVE. So, there are, in fact, too many elephants in this region of Africa; which includes Zimbabwe. These populations need to be drastically reduced in number for good and just management reasons. And if this does not happen, soon, the elephants will totally destroy ALL southern Africa’s national parks, and their one-time super-biological-diversities will be no more! And WHEN (NOT IF) that happens, it will represent an environmental catastrophe of immense proportions. It will also be a crime that has been perpetrated against Africa‘s wildlife, its national parks, and its people: the blame for which will lie fairly and squarely at the feet of the FWS (and CITES). And I´m not from any African country.